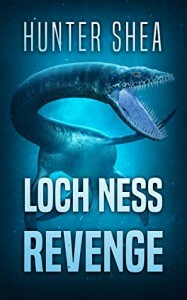 Loch Ness Revenge by by Hunter Shea is about a brother and sister twins who are taking revenge on the Nessie that killed their parents. Plot 2/5: This could have been an interesting plot of revenge, but it just didn't make sense. I kept wondering why so many Nessies had never been seen. I think the amount of Nessies should have been kept to a minimum for the story to be more believable. Characters 3/5: The characters could have used a bit more fleshing out. Pacing 3/5: A steady pace with spurts of action. Writing 3/5: Decent writing with few typos and grammar errors. Won in a giveaway, and received a copy from the author.